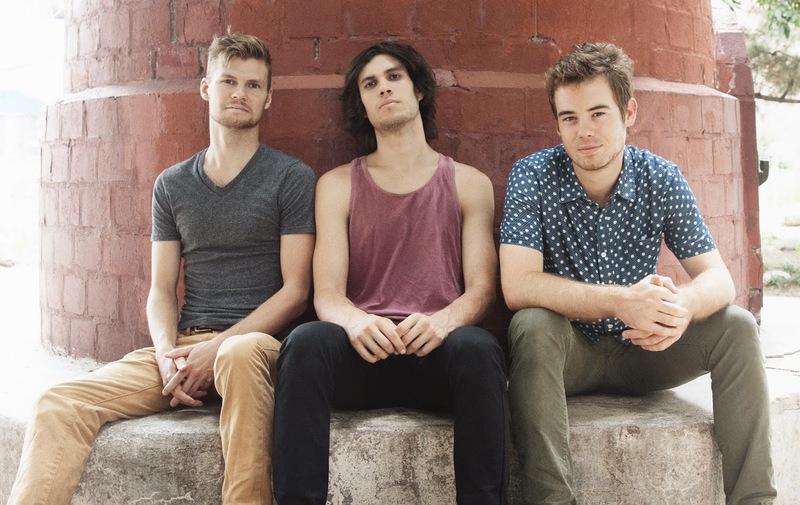 Carbon Mirage Releases 2nd Album "The Peak"
Carbon Mirage are back from touring New England and Mid-Atlantic just in time for their 2nd album release! Download "The Peak" on iTunes or BandCamp and be sure to share it with your friends! The album release show is schedule for Thursday, September 25th at Muchmore's in Williamsburg. Carbon Mirage Goes on Tour in Sept 12-20, Free Download of "Bed-Stuy Bounty Hunter" from the new upcoming album "The Peak"
Carbon Mirage, a New York City based instrumental trio, is going on tour through the Northeast from September 12th - 20th hitting Portland, Burlington, Portsmouth, Hudson, Ithaca and Pittsburg! 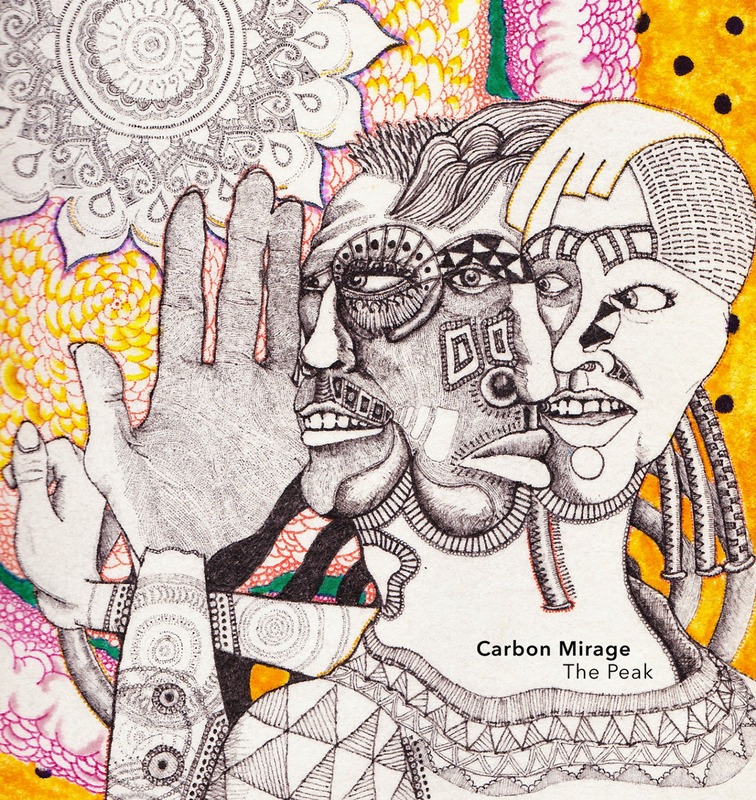 Carbon Mirage's sound is a collision of rock and jazz. With influences ranging from Radiohead to Miles Davis, Sun Ra to Jimi Hendrix, each track moves in dynamic waves and always manages to get people on their feet. 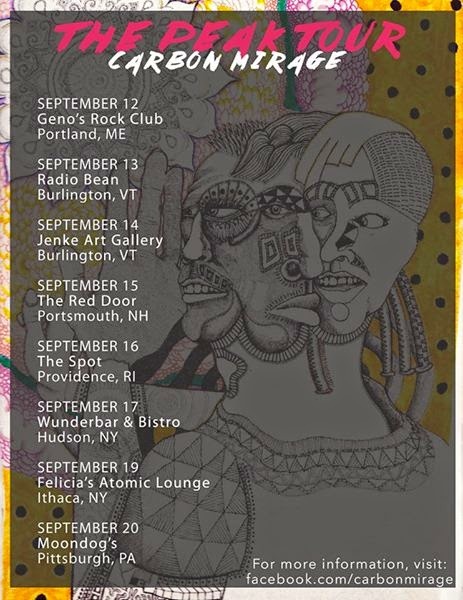 Fore more details on the band's tour dates see the awesome poster below! Light-Minutes Away Presents an Official CMJ Showcase 2014 @ Bar Matchless - Thursday, October 23rd!!!! OK! It's official! 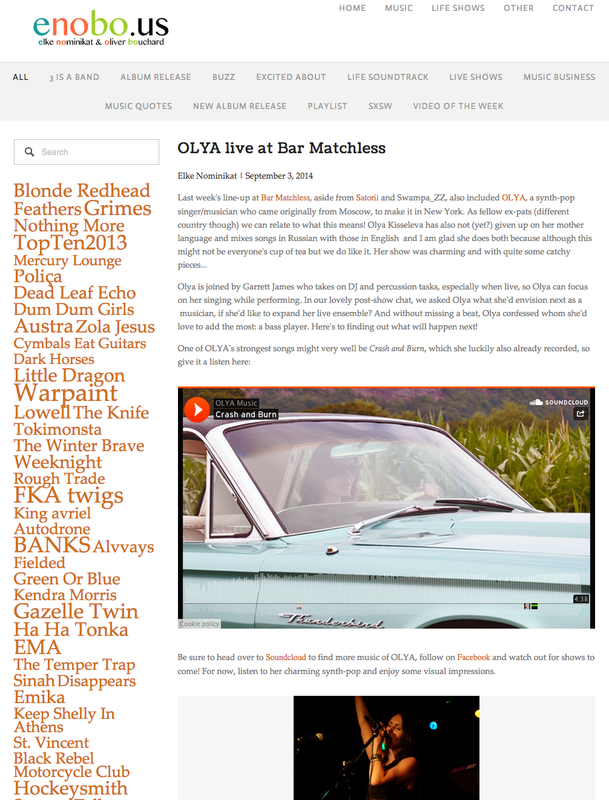 I am totally excited to announce that we are doing our first CMJ SHOWCASE this year at our Williamsburg homebase BAR MATCHLESS on THUR, OCT 23 presented by LIGHTMINUTESAWAY.COM! 5 weeks from now, 5 amazing bands!!!! 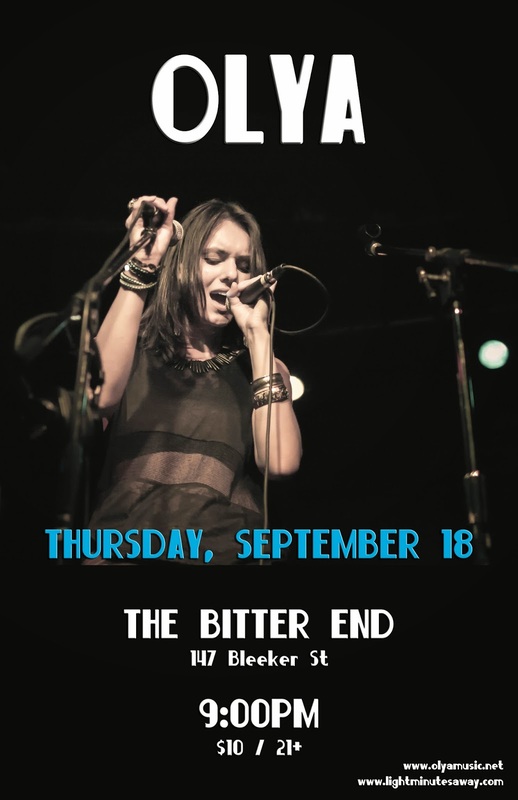 OLYA adds a show to her fall calendar at the The Bitter End - the famed club in the West Village that became home for her and her first band after the release of "Carefully". They are now ready to rock The Bitter End as a synth-pop duo with their new indie dance sound!!! 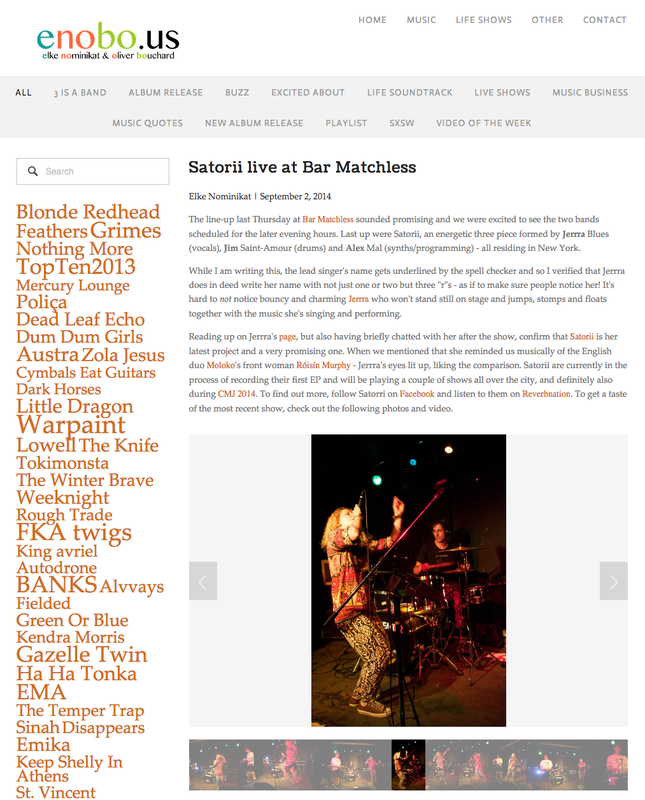 Great reviews by Enobo.us on SATORII and OLYA after their Matchless show! Last week at Bar Matchless a rather intriguing couple entered the showroom in the back of the club to catch Satorii's and Olya's performances. We chatted in between the sets and at the end of the night, touching upon numerous topics: music, background, inspiration, influences. Just a few days after the Labor Day weekend, I woke up to these two very heartfelt articles on Elke and Oliver's blog Enobo.us. Check it out!!!! 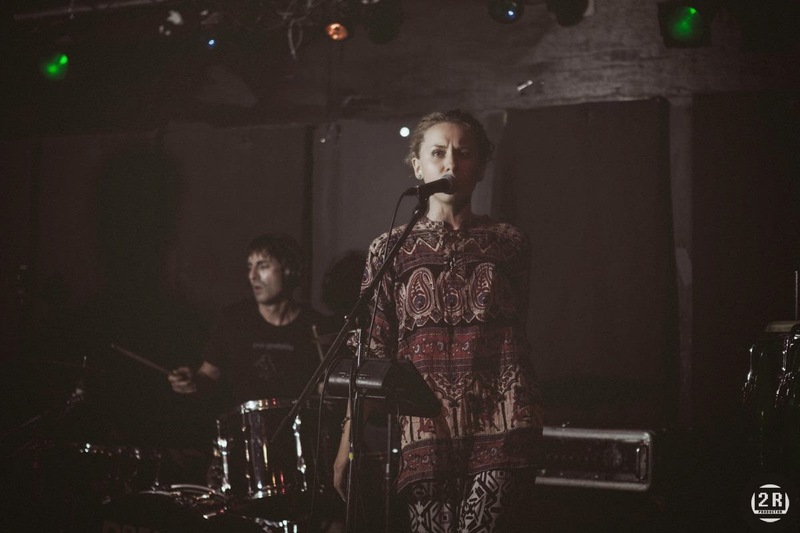 8/28/2014 Show at Bar Matchless w/ Swampa_ZZ, Satorii and OLYA was a blast! !